Fantastic Beasts and Where to Find Them is a 2016 British fantasy film directed by David Yates and distributed by Warner Bros. Pictures. A spin-off of the Harry Potter film series, the film was produced and written by J. K. Rowling (in her screenwriting debut), inspired by her book of the same name. The film stars Eddie Redmayne as Newt Scamander with Katherine Waterston, Dan Fogler, Alison Sudol, Ezra Miller, Samantha Morton, Jon Voight, Carmen Ejogo and Colin Farrell in supporting roles. Principal photography began at Warner Bros. Studios, Leavesden on 17 August 2015. 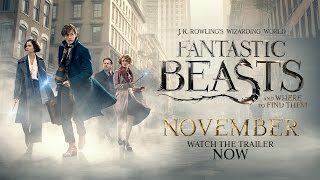 Fantastic Beasts and Where to Find Them premiered in New York City on 10 November 2016 and is scheduled to be released worldwide on 18 November 2016 in 3D, IMAX 4K Laser and other large format theatres.